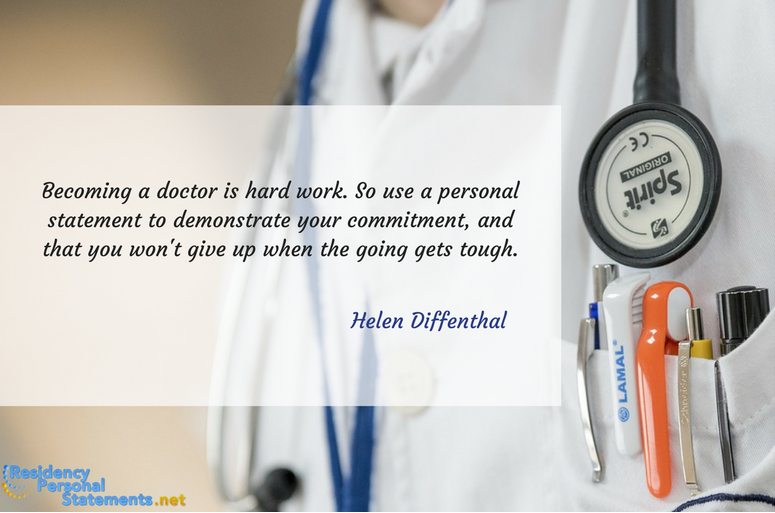 If you want to get onto a research medical fellowship then you will be in competition against many other like-minded individuals who will all be as excellently qualified as you are. Places are limited and every year many applicants will be disappointed that they have not been placed in the program that they wanted. Gaining the right placement can have a huge impact on your future career, so it is very important that you are able to put in the necessary effort into your application to get yourself noticed. That is where your research personal statement can cover your back. Fellowship applications are generally handled through the fellowship process within ERAS (Electronic Residency Application Service). This allows you to upload all of the required information including your personal statement, CV for residency application, and also to review and apply to all of the available places. Each program that you apply to will then be able to review your application and if they like what they see they will be able to invite you for an interview. Often there will be little to choose between you and many of the other applicants when it comes to qualifications and experience. This is why your personal statement can be so important. It can be your only opportunity to make yourself stand out from the others. Therefore you must ensure that you invest the effort required to make it as good as it can be so that you are noticed over your competition. 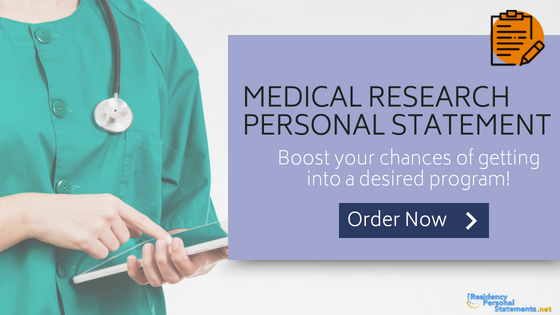 Applying to be a medical research fellow is a hard task if you want to be one of the few selected. Getting an interview and then being placed high on the NRMP Match is going to be far from easy. This is why you must take the time to ensure that your personal statement is going to be capable of really making you stand out. Many will make the mistake of using a statement that has been modified from one used earlier within their education, while others will simply create something that is bland and boring. You have to really grab the attention of the reader if you want to make yourself memorable. Give a clear reason as to why you have an interest in your specific area of medicine. Show why you want to enter into research in that field. Give an indication of what research you want to conduct and why. Show what you have already achieved in your field. Demonstrate that you have the research skills that are required to be successful. Give an idea as to where you see your career heading over the next 5 to 10 years. Provide a clear reason as to why you want to be part of their specific research fellowship. How you write can have as much of an impact on your chances of success as what you cover within your statement. It is important that you approach this at the level at which you are applying. You will not want to talk about your experiences in high school, or refer to things that happened many years ago. Your statement must be relevant as well as being current. Use an interesting anecdote that can provide a theme for your writing as well as gaining the attention of the reader. Ensure that your opening lines are very attention-grabbing so that they will want to read on to discover more about what you have to say. You can take a look at some personal statement samples to get an inspiration. Never use clichés within your writing, this shows a lack of original thought on your part. Avoid any quotations unless they are vital; the reader wants to hear what you have to say. Be very concise with your writing; you have a limited amount of space in which to communicate how you are a perfect fit to their program. Don’t include anything that is not totally relevant to your application. If it does not add to your bid for a place then it should not be in your statement. Don’t make any claims that you cannot substantiate. If you work well under pressure provide an example of a situation and demonstrate how you acted and what the outcome was. Proofread what you have written very carefully. Simple mistakes that should have been eliminated can cause your personal statement to be discarded. As a specialized service, we are able to provide you with support through real experts in your area of application. Our experts hold post-graduate degrees in your area of application and fully understand the application process and the expectations of the committee that will review your application. They have the experience required to be able to work with you to craft a truly attention grabbing statement, whether it is a pediatric or anesthesia residency personal statement, and help you to boost your chances of being interviewed. The services that we provide are always delivered on time and are covered by a full satisfaction money back guarantee. Want a reliable and affordable help with your personal statement for research fellowship? Don’t hesitate to contact us right now!